Wow, this one was interesting! University Press Audiobooks always has interesting titles and when I was offered this one, I knew I wanted to produce it. 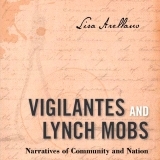 Lisa Arellano looks at non-fiction narratives as “history” and shows how they “conform to a common formula whose purpose is to legitimate frontier justice and lynching”. Drop me a line if you’d like a free reviewer copy.